Relaying a bitcoin transaction might sometimes be tricky if you're stuck behind a firewall or caught up in some scenarios where a captive portal prevents access via a free wifi hotspot provider. In some cases, these scenarios might still provide access to DNS without any limitation. In this tutorial, we will demonstrate a mechanism through which you can access a bitcoin node over a DNS tunnel. In addition to this, we will need a remote server that we will be using to configure a DNS tunnelling daemon. To understand how we'll use DNS to tunnel data, we'll need a little bit of background on how the domain name system (DNS) works. DNS in its simplest form is an internet standard for translating names to numbers, kind of like directory. The goal of domain names is to provide a mechanism for naming resources in such a way that the names are usable in different hosts, networks, protocol families, internets, and administrative organisations. It consists of various kinds of record types such as lookups for names to numbers which are called A (Host address) name records, or lookups for names to other names including Canonical name records (CNAME), or even mail MX (Mail eXchange) records. We can see this in action by doing the following lookup. Here we can see the name bitcoindev.network resolves to an A name record which points to the address 104.18.46.61. This mechanism is used by various internet applications behind the scenes so that you don't have to remember the IP addresses off by heart. There is however another interesting record which comes in useful for the purposes of our requirements, and that is defined in the RFC1035 specifivation called the TXT record. As indicated by the specification, the TXT data record can be used to store arbitrary text data. We can see this in action by issuing a TXT record query against the DNS servers for the tutorial.bitcoindev.network domain as follows. tutorial.bitcoindev.network. 300 IN	TXT	"Hi there bitcoin developer!" Here we can see a TXT record for the domain tutorial.bitcoindev.network having the value of "Hi there bitcoin developer!". The character limit of this record prevents us from marshaling large blobs of text, but can be used to chunk data and create a communication channel through exploiting this record type. Dns2tcp is a tool for relaying TCP connections over DNS. There is only a simple identification mechanism but no encryption. DNS encapsulation must be considered as an insecure and anonymous transport layer. Resources should be public external services like ssh, ssltunnel or in our case bitcoin! It consists of two components including a server (dns2tcpd) and a client (dns2tcpd). There are various tools available for achieving this including iodine dnscat2 to name just a few. Here we are using dns2tcp as this was the simplest and most effecient way of demonstrating this. The following needs to be performed on a server which is not behind the firewall or captive portal network. We are configuring the listen parameter here to listen on all interfaces so that we can access this server externally. An important section here is for our bitcoin channel, which has been configured to connect to a bitcoin node on port 8333. You will need to update this based on your own requirements. We can confirm that this is up and running. We should now have a dns2tcp daemon running on our remote server. Next, we need to install a copy of tcp2dns on our client machine. Discover the remote server connection types. Note : Compression SEEMS available ! Great! we can see the three services we have configured. Create a local configuration file with the details for connecting to our server. The details for your domain and key need to match that of those configured on our server. The server ip here is the ip of the remote server currently running dns2tcpd. Next we can test if this connection is working. 000000a0: 0000 5df6 e0e2 f9be b4d9 616c 6572 7400  ..].......alert. 000000b0: 0000 0000 0000 a800 0000 1bf9 aaea 6001  ..............`. Well done, we should be recieving a resposne from our server. Here we simply pass a raw bitcoin wire protocol version message to the local port 8333 that has been exposed via dns2tcp. For more information on the approach used in this step, please see the Bitcoin wire protocol 101. Tutorial. You could also make use of the ssh channel by creating a socks proxy. 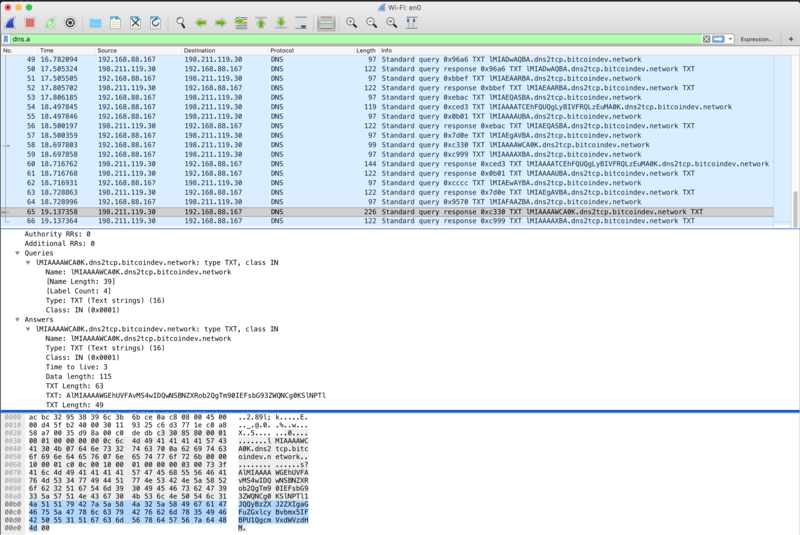 We can also inspect the aforementioned DNS packetsby using a protocol analyser like wireshark or tcpdump. Here is an example using the command line version of wireshark called tshark. [email protected] $ tshark -i en0 -f "udp port 53" -Y "dns.qry.type == 16 and dns.flags.response == 0"
In this tutorial we had a look at accessing our bitcoin node via a DNS tunnel using dns2tcp. There are various other ways in which you could achieve this, but we hope this inspires you to find and share them!